NBC Olympics and Adobe launch new Olympics Mobile Apps. Today, NBC Olympics launched two mobile apps for the London 2012 Olympic Summer Games, marking the first time in Olympics history that viewers are able to access the games directly from their smartphone and tablet devices. The entire Olympics mobile experience is powered by Adobe, enabling NBC to create, deliver, authenticate, monetize and measure the Olympics across mobile devices. 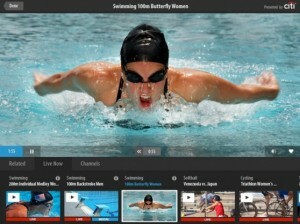 WATCH: Adobe and NBC Olympics Launch Apps for 2012 Olympic Games – Youtube video: http://youtu.be/uNLh85pKLw4. NBC Olympics Live Extra – Viewers can live stream more than 3,500 hours of content, including all 32 sports, every athletic competition and all 302 medal events. NBC Olympics – Views can enjoy short-form highlights, TV and online schedules, live results, columns and the new Primetime Companion feature — the complementary, second-screen experience for NBC’s nightly primetime Olympic broadcasts. NBC Olympics Live Extra and NBC Olympics are available to download for free from the App Store on iPhone, iPad and iPod touch or at www.itunes.com/appstore. They are also available for free from Google Play on select Android devices or at www.play.google.com. The apps are interconnected, so you can easily launch one of the apps from within the other. Both apps offer social media integration that lets you share and communicate with friends via Facebook, Twitter and Google Plus as the Games happen in London. You can also set virtual reminders for your favorite sport events, and, pause or rewind. NBC Olympics Live Extra will also live stream the Olympic content that airs on the four NBCU cable channels – NBC Sports Network, MSNBC,CNBC and Bravo. In another first, NBC Olympics Live Extra will provide multiple concurrent streams for select sports, such as gymnastics (each apparatus), track and field (each event), and tennis (up to five courts). For example, during a session of track and field, instead of viewing only a single feed that moves from event to event, a user can choose to watch a stream dedicated to a specific event, such as the long jump or javelin. The vast majority of live stream content on NBC Olympics Live Extra will only be available to verified cable, satellite or telco customers. In order to access the live stream content, existing cable, satellite and telco customers should follow these verification procedures. You are signed in throughout the Games on that device! Customers with multiple devices should repeat the procedure on each device. Access to this content is free for customers as part of their video subscription — there is no additional charge. For customers who do not have a username and password, they should contact their cable, satellite or telco provider to create one. More information about the process, including contact information for cable, satellite and telco providers, can be found at: www.nbcolympics.com/liveextra/help. Built and powered by Adobe, NBC Olympics is on the cutting edge of sports business by utilizing a host of Adobe solutions to create, deliver, monetize and measure the apps from Adobe Creative Suite, including Photoshop, Illustrator, Acrobat, Flash Builder, Flex and others; Adobe AIR to deliver a consistent content and video playback across platforms; Adobe Auditude for advertising directly within the apps; Adobe Catalyst to measure traffic and engagement across apps; to Adobe Pass for authentication services.AdobePass is the leading “TV Everywhere” technology and supported by over 97 percent of all U.S pay TV households. The entire Olympics mobile and tablet experiences were built by and are powered by technologies that make up Adobe’s Project Primetime. The Primetime Companion is the ultimate complementary, second-screen experience for NBC’s nightly primetime Olympic broadcast. To learn more about Adobe technology powering the apps and for a behind-the-scenes video, go to http://blogs.adobe.com/digitalmedia. For more information on NBC Olympics’ coverage of the London Olympics, please visit http://nbcsportsgrouppressbox.com/. Sports Techie, get ready for the most Digital Games ever by setting up your smart phone or tablets if you have one, or upgrading if you can, in order to stream the entire 2012 London Games Live or OnDemand, with the new NBC Sports and Abode Olympics Mobile Apps. It’s going to be an Olympic second screen summer for the ages.